Finance Minister Piyush Goyal on February 1, 2019 presented the Union Interim Budget 2019-20, an estimate of revenues and expenditure of the Government during a financial year 2018-19. On the similar lines, various state governments have begun presenting the budget of their respective states. The Meghalaya budget 2019-20 has a fiscal deficit of Rs 1323 crore, which is around 3.65 percent of the Gross State Domestic Product (GSDP). The total expenditure, excluding repayment of loans, was estimated at Rs 15786 crore, leaving a deficit of 1323 crore rupees. It is estimated that tax revenue collection of Rs 2090 crore and non-tax revenue collection Rs 601 crore would be generated. The revenue collected by the taxation department is expected to touch Rs 1478 crore by the end of year, thus registering a growth rate of 15 percent. The overall tax revenue including Goods and Services Tax (GST), Excise and Motor Vehicle Taxes is estimated at Rs 1716 crore for 2018-19. The advance estimates indicate that the GSDP for 2018-19 is expected to be Rs 32972 crore, an increase of 10.41 percent over 2017-18. It included setting up of 11 Ekalavya Model Residential Schools in the state. An allocation of Rs 1077 crore was made for the education sector for 2019-20, marking a 17 percent increase from 2018-19. To improve the health scenario in the state, the Budget proposed a development outlay of Rs 740 crore for 2019-20, an increase of 21 percent over the previous year. It proposed an allocation of Rs 590 crore for the roads and bridges sector. It proposed an outlay of Rs 1045 crore for MGNREGS in 2019-20. Haryana Finance Minister Captain Abhimanyu presented the Rs 1,32,165.99 crore tax free budget for 2019-20 in the State Assembly on February 25, 2019. Over Rs. 46000 crore have been allocated to 15 Sustainable Development Goals being implemented in the state. No new tax is imposed. However, the Finance Minister proposed to raise revenue receipts of Rs 82,219.41 crore in 2019-20 through efficient realisation of tax and non-tax receipts over revised estimates of 2018-19 receipts of Rs 76, 828.11 crore. It allocated 26.12 percent of total budget to Economic services like agriculture, irrigation and rural electrification subsidy. It allocated 11.61 percent of the Budget for education and 27.91 percent for repayment of debt. The government plans to bring about a scheme to provide solar water pumping systems to farmers to meet their irrigation needs. Under this scheme, farmers would be provided 2 HP and 5HP solar water pumping systems with 75 percent State Subsidy and 25 percent user share. Bhavantar Bharpayee Yojana for four horticulture crops in order to ensure that every farmer recovers at least the cost of cultivation, in the eventuality of drop in market prices. Setting up new thematic market by the Haryana State Agricultural Marketing Board, such as integrated Apple Market at Pinjore, wholesale market for spices at Sirsa and Kundli, and wholesale market for flowers at Gurgaon. It announced a compensation of Rs 12,000 per acre for the crop damage caused by natural calamity. Under the ‘Horticulture Vision’, the state aims to double the area under horticulture from the present 8.17 percent to 15 percent and triple the produce in the state by 2030. Setting up of a rapid milk testing facility at each Government Veterinary Hospital level to detect the milk adulteration in rural areas. Under the ‘Assistance to Milk Cooperatives’ scheme, the state government has provided assistance to purchase 700 Automatic Milk Collection Units/Data Processor Milk Collection Units. It proposed to set up ethanol plant in Shahabad Sugar Mill and to modernise two cooperative sugar mills in Panipat and Karnal with a total cost of Rs 750 crore by 2020-21. The Delhi Government on February 26, 2019 presented the Rs 60,000 crore budget for 2019-20 in the Assembly. 26 percent of total budget that is around Rs 15000 crore have been earmarked for education. Around 13000 seats will be added to engineering and polytechnic colleges of Delhi. Considering the lack of applied sciences courses in Delhi, the Government announced to set up new Applied Sciences University apart from setting up a Teacher Training University and an MBA course at Delhi Technological University. Computer tablets will be provided to students scoring above 80 percent in class X in government schools. Those in class XI and XII in Rajkiya Pratibha Vikas Vidyalayas (RPVVs) and schools of excellence will also receive the tabs. A sum of Rs 9 crore has been allocated for the scheme. A sum of Rs 2,370 crore has been allocated for the Delhi Jal Board and Rs 476 crore for Lifeline Water Scheme where 20 KL of water is given for free. A target has been set to increase water production by 246 MGD (Millions of Gallons per Day) by using excess water in the Yamuna. Rs 100 crore were allocated for providing Minimum Support Price (MSP) to farmers as recommended by the Swaminathan Commission. An amount of Rs 7485 has been allocated for the health sector. A new scheme will be launched to provide financial help to differently abled parents for marriage of their daughters. The total outlay for the transport sector has been kept at Rs 1,807 crore. A total of Rs 375 crores have been set aside for 100 mohallah clinics. A provision of Rs 6,380 crores has been made in the budget for Municipal Corporation of Delhi. Bihar Chief Minister and Finance Minister Sushil Kumar Modi on February 12, 2019 presented the Rs 2,00,501 crore state budget in the Bihar Assembly with focus on education, rural development and energy sectors. The Bihar budget 2019 has revenue surplus of Rs 21,516.99 crore during 2019-20 which is 3.76 percent of GSDP. GSDP is estimated at Rs 5,72,827 crore for 2019-20. It allocated Rs 34,798 crore for the education sector; Rs 15,699 crore for rural development sector; and Rs 8,894.32 crore for the energy sector. It has provision for opening 11 medical colleges in the State. It allocated Rs 16,734 crore towards the welfare of the Schedule Castes and Rs 1,565 crore towards the Scheduled Tribes. It granted Rs 1,43,133.73 crore for the development expenditure and Rs 54,367.30 crore for non-development expenditure for 2019-20. The Annual Scheme Outlay for the financial year 2019-20 was estimated at Rs 1,00,000.98 crore, which is Rs 8,206.25 crore more than for the year 2018-19. The Establishment & Commitment expenditure for the financial year 2019-20 was estimated at Rs 99,110.01 crore. The Grants in aid from Central government to state was estimated at Rs 49,019.38 crore in 2019-20. The Yogi Adityanath-led Uttar Pradesh government on February 7, 2019 presented its annual budget of Rs 4.79 lakh crore for the fiscal year 2019-20 with a focus on infrastructure, cow welfare and development of religious places. The UP Budget 2019-20 proposed overall expenditure of around Rs 650 crore for cow welfare with Rs 247.60 crore for maintenance and construction of gaushalas in rural areas. Rs 200 crore was sanctioned for Kanha gaushala and destitute cattle shelter scheme in urban areas. The government imposed a special cess on liquor sales in the state, of which around Rs 165 crore will be utilised for the maintenance of destitute cattle-heads of the state. The Budget granted Rs 64 crore for the Pt Deen Dayal Upadhyay Small Dairy Scheme to set up 10,000 units. A budgetary provision of Rs 56 crore was made for the establishment of dairy in Mathura and Rs 5 crore allocated for 2019-20 for various programmes under the Uttar Pradesh Dairy Policy, 2018. It also provisioned Rs 892 crore for the National Agriculture Development Scheme and Rs 450 crore for National Crop Insurance Programme. Rs 3,194 crore granted for the construction of expressways in the state. Rs 1,194 crore allocated for Purvanchal Expressway and Rs 1,000 crore sanctioned for Bundelkhand Expressway and Gorakhpur Link Expressway each. Around Rs 500 crore allocated for land acquisition to develop a defence corridor along with the Bundelkhand Expressway. The government allocated Rs 800 crore to acquire land for Jewar Airport; Rs 200 crore allocated for the construction of an airport in Ayodhya. It proposed Rs 207 crore for expansion and beautification of the road from the Ganga bank to the Vishwanath Temple in Varanasi, and Rs 101 crore for the integrated development of major tourist places in Ayodhya. Rs 1 crore granted to strengthen the Vrindavan Shodh Sansthan. For minority welfare, Rs 942 crore under the Scholarship Scheme for students belonging to minority communities was sanctioned and Rs 459 crore proposed for modernisation of Arabi-Farsi Madarsas. The budget proposed Rs 100 crore for the development of cremation grounds in rural areas of the state. For rural development, it allocated Rs 6,240 crore under Pradhan Mantri Awas Yojana (Gramin) and Rs 3,488 crore for implementation of National Rural Employment Guarantee Scheme. Rs 2,579 crore allocated under the Old Age and Farmers' Pension Scheme. Rs 50 crore allocated for Wi-Fi facility in all the colleges and universities. Rs 242 crore allocated to provide grant-in-aid to Sanskrit Pathshalas in order to encourage education of Sanskrit. Rs 2,275 crore allocated for Mid Day Meal programme. It allocated Rs 250 crore for One District, One Product (ODOP) scheme; Rs 6,000 crore for Swachh Bharat Mission; Rs 224 crore for Shyama Prasad Mukherjee Rurban Mission. Rs 2,954 crore allocated for the National Rural Drinking Water Programme and Rs 1,393 crore for National Rural Livelihood Mission. It allocated Rs 1,200 crore to the proposed new scheme called the 'Kanya Sumangala Yojana' to raise the health and education standard of girls. Overall, Rs 4,004 crore were allocated for the nutrition programme. Tamil Nadu Deputy Chief Minister O Panneerselvam on February 8, 2019 presented a tax-free Budget for 2019-20, projecting a sharp decline in revenue deficit and a fiscal deficit within the threshold of 3 percent of GSDP. The revenue deficit will decline to Rs 14,315 crore in 2019-20 from Rs 19,319 crore in the revised budget estimate for 2018-19. The fiscal deficit is estimated to be Rs 44,176 crore in the BE 2019-2020. Tamil Nadu is a better performing State in implementing Goods and Services Tax (GST). However, it is yet to receive its due share of IGST of Rs 5,454 crore and the assured GST compensation of Rs 455 crore for 2017-2018. The Tamil Nadu Generation and Distribution Corporation (TANGEDCO) will establish floating solar power projects in Theni, Salem and Erode districts with a capacity of 250 MW at a cost of Rs 1,125 crore and the Kadaladi Ultra Mega Solar Photovoltaic Park Power Project of 500 MW at a cost of Rs 2,350 crore. A sum of Rs 6,724 crore has been included in RE 2018-2019 and Rs 7,262 crore is being included in BE 2019-2020 for retail IMFL shops. A Rs 2,000 crore comprehensive parking management project will be launched. It will have underground parking facilities, multilevel parking facilities and on-lane smart parking to accommodate two lakh four-wheelers and an equal number of two-wheelers. Implementation of Nava Bengaluru Kriya Yojana at an estimated cost of Rs 8,015 crore, of which Rs 2,300 crore will be granted in 2019-20. It granted Rs 250 crore to Krushi Bhagya scheme. ; announced grading of Organic and Zero budget farm produce, and 50 percent subsidy to eligible entrepreneurs and startup entrepreneurs with a grant of Rs 2 crore. It allocated of Rs 368 crore for “Mukhyamanthrigala Sukshma Neeravari Yojana” during 2019-20. The special package of Rs 150 crore announced to improve the economic condition of pomegranate and grape growers. It proposed development of 7,940 km length of roads at a cost of Rs 10,000 crore. The work for up-gradation of roads and bridges will be carried out at a total cost of Rs 5,690 crore. The extension of Metro line from Central Silk Board junction to the Outer Ring Road-Airport via K R Puram via Hebbal will be carried out at a cost of Rs 16,579 crore. Rs 50 crore allocated for implementation of a comprehensive mobility scheme. It also proposed the establishment of state-of-the-art language skill training centres in Bengaluru, Mysuru, Belagavi and Kalaburgi divisions in the name of 'Alur Venkatarao' at a cost of Rs 2 crore. It allocated expenditure of Rs 638 crore under Ksheera Bhagya scheme for school going children and Rs 405 crore for Anganawadi children. It proposed ‘Mini Olympic Games - 2019’ to identify and encourage sports persons between 13 and 15 years. Creation of 4 new taluks proposed in Harohalli (Ramanagar District) and Chelur (Chikkaballapur District), Terdal (Bagalakot District) and Kalasa (Chikkamagalur District). Assam Finance Minister Himanta Biswa Sarma on February 6, 2019 presented Rs 1,193.04 crore deficit budget for 2019-20. The Assam Budget 2019 introduces several new schemes including sale of rice at Rs 1 per kilogram for the poor and providing 1 tola (10 gram) gold to the brides. Social security schemes announced to cover the young widows and 'divgyangs'. Scholarship schemes announced for the higher education of girls from the minority communities. Launch of ‘Affordable Nutrition and Nourishment Assistance (ANNA) Yojana’ from March 2019. Under the scheme, government will provide rice at Re 1 per kg instead of the present Rs 3 per kg for the benefit of 53 lakh households. The state will give one tola gold (10 gram Gold) to brides belonging to all such communities of state where it is customary to provide gold at the time of wedding. The gold benefit will be extended to those brides who belong to families whose yearly earning is less than Rs 5 lakh. Government will also provide battery operated 'e-bikes' to all girl students who secure 1st division or above in their higher secondary examinations. Rice will be provided free of cost to 4 lakh families in the tea garden areas and 2 kg of sugar will be provided per month to the families of the tea garden workers. For welfare of widows, budget announces a new scheme under which any woman up to the age of 45 years, who loses her husband, will receive an amount of Rs 25,000 as 'Immediate Family Assistance'. The widow will also be eligible for a monthly pension of Rs 250 until she attains the age of 60 years. The government earmarked Rs 200 crore for scholarships to girl students of minority communities for higher education. 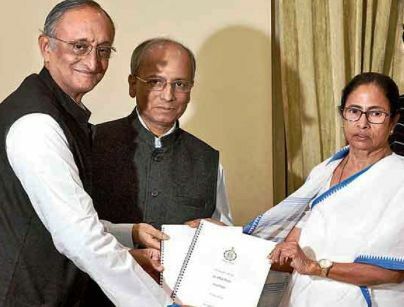 The West Bengal’s Finance Minister Amit Mitra on February 4, 2019 presented the state Budget 2019-20 of Rs 2.37 lakh crore with a Rs 9 crore deficit. The West Bengal Budget encompasses benefits for small farmers, unemployed youth and women. The Budget was presented amid protest by Chief Minister Mamta Banerjee over the CBI's arrest of the Kolkata Police Chief in connection with a Saradha scam. The Budget raises the monthly wages for contractual workers and data entry operators by Rs 2000 and Rs 500 for Asha and Anganwadi workers. It proposes a raise of ex-gratia payment to contractual workers to Rs 3 lakh from Rs 2 lakh. It offers Rs 1 lakh financial assistance for unemployed youth. The full exemption on education cess and rural employment cess for tea gardens has been extended for two more years. The budget allocates Rs 9,556 crore for the healthcare sector in 2019-20. The state’s tax collection grew to Rs 57,700 crore in the financial year 2018-19. Bengal government has been giving more emphasis to develop the MSME sector in the state. The credit flow to this sector achieved 13 percent growth of Rs 20,287 crore during April-September 2018. Note: West Bengal becomes the third state after Telengana and Odisha to come out with a minimum income plan for small farmers. • Goa Chief Minister Manohar Parrikar, who also holds Finance portfolio of the state as well, presented the state annual budget of Rs 19,548.69 crore for the year 2019-20 as against Rs 17,123.28 crore for the year 2018-19, representing an increase of 14.16 percent over last year. • The total estimated expenditure on Revenue Account was Rs 13,308.26 crore while the expenditure on Capital Account was Rs 4987.45 crore. • There was an increase in the allocation for Capital Expenditure by 18.29 percent, as compared to the budget estimate for the last year, which was 4216.25 crore rupees. • Overall the budget indicated a revenue surplus which was estimated to be Rs 455.10 crore. · Meghalaya Chief Minister Conrad K Sangma, who also holds the finance portfolio of the state, presented the budget 2019-20 on March 12, 2019. · The Meghalaya budget 2019-20 has a fiscal deficit of Rs 1323 crore, which is around 3.65 percent of the Gross State Domestic Product (GSDP). · The total expenditure, excluding repayment of loans, was estimated at Rs 15786 crore, leaving a deficit of 1323 crore rupees. · It is estimated that tax revenue collection of Rs 2090 crore and non-tax revenue collection Rs 601 crore would be generated. · The revenue collected by the taxation department is expected to touch Rs 1478 crore by the end of year, thus registering a growth rate of 15 percent. · The overall tax revenue including Goods and Services Tax (GST), Excise and Motor Vehicle Taxes is estimated at Rs 1716 crore for 2018-19. · The advance estimates indicate that the GSDP for 2018-19 is expected to be Rs 32972 crore, an increase of 10.41 percent over 2017-18. · It included setting up of 11 Ekalavya Model Residential Schools in the state. · An allocation of Rs 1077 crore was made for the education sector for 2019-20, marking a 17 percent increase from 2018-19. · To improve the health scenario in the state, the Budget proposed a development outlay of Rs 740 crore for 2019-20, an increase of 21 percent over the previous year. · It proposed an allocation of Rs 590 crore for the roads and bridges sector. · It proposed an outlay of Rs 1045 crore for MGNREGS in 2019-20.